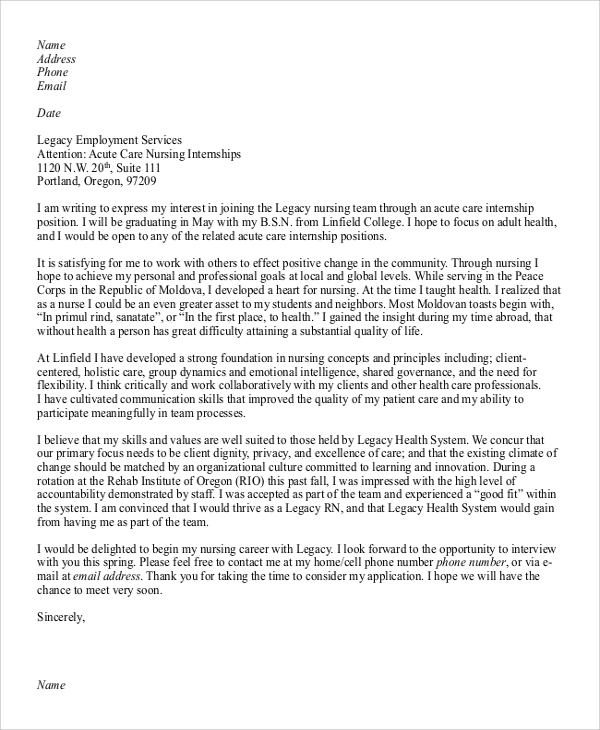 There are two types of cover letters which can be defined as Nursing Cover Letters. First is, when a professional person is trying to get a managerial position and the second one is, when a new employee who has joined the company recently is willing to get a permanent position. In both the situations, they can write a nursing cover letters. 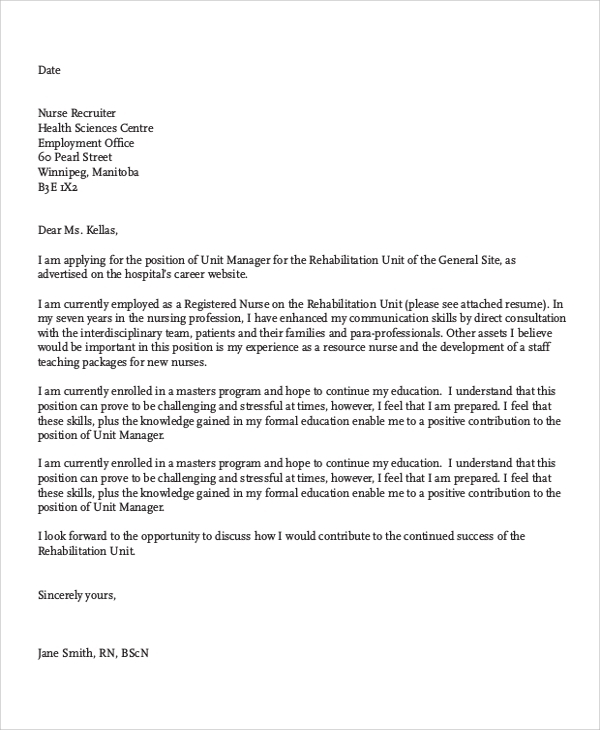 This letter should be written in a polite and convincing way so that you can achieve your goal. 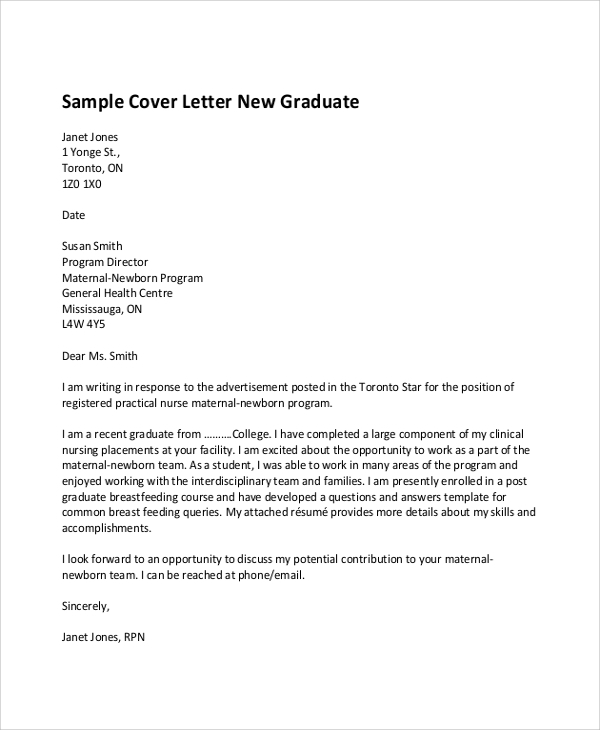 Here are some sample nursing cover letters which can help you to understand the concept easily. Your cover letter should define you perfectly even when you are not present in front of the recruiter. 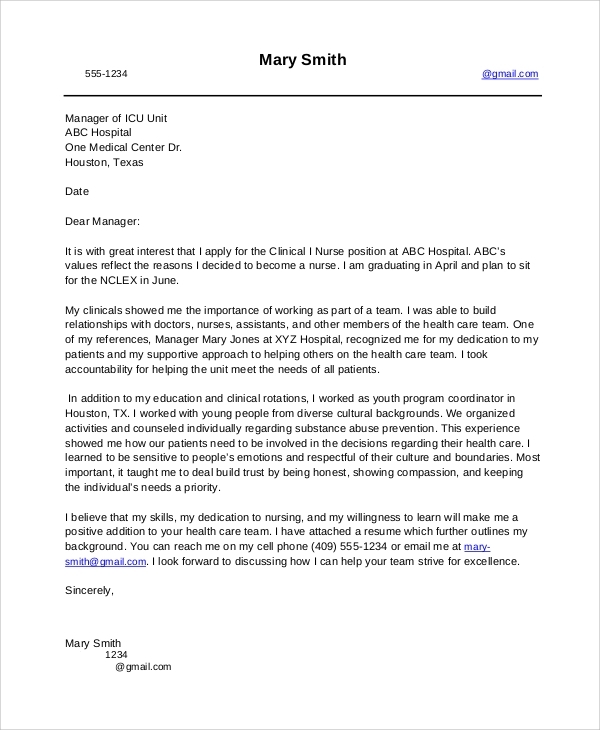 All the reasons which can describe your willingness to join the company should be clearly mentioned in the nursing cover letter to motivate the person to call you for an interview. There is a difference between the resume and the cover letter. The person who is going to select the candidates for the interview will first go through your cover letter which will describe you and then if he/she wants to read out your resume, then only he/she will go through it, otherwise, he/she may not read it at all. Keywords which are related to the job you are applying for should be mentioned necessarily because it might be possible that your resume might get filtered with the database according to the keywords which the recruiter think should be present in the resume. 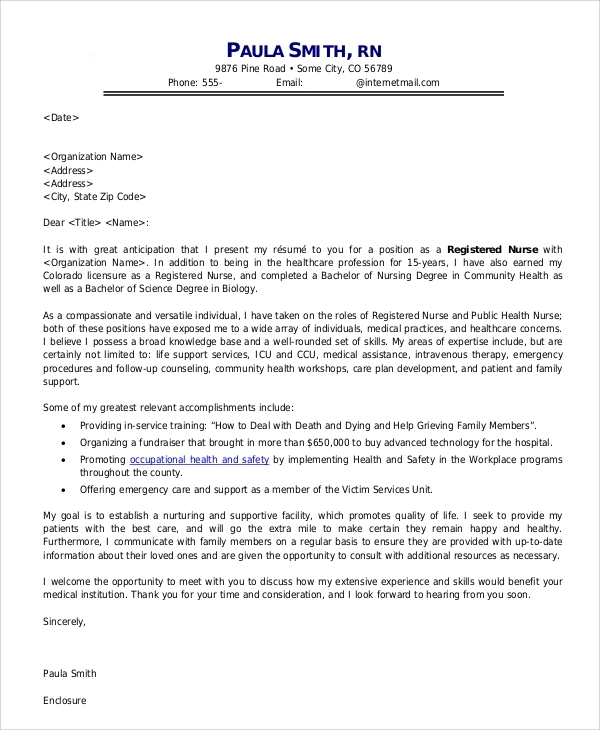 In this cover letter, you have to describe your previous nursing experience which can be helpful for the position you are applying for in a hospital. 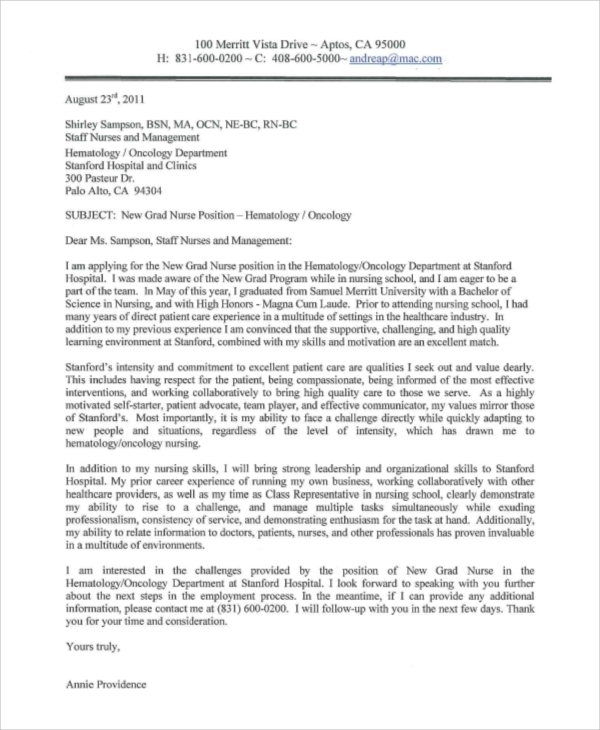 Your letter should be relevant to the job description and should show your willingness to join the hospital for a specific position. Being a fresher, it is vital for you to prepare your resume and cover letter in a convincing way because you have no experience, so you need to describe your abilities and achievements of your college which can be relevant for the particular job. Any person who is going to call candidates for an interview will first go through the resumes, and then if he is interested to read, he will read the cover letters. Resume describes you, your abilities, skills, experience, while cover letters will contain the information that why you are willing to join a particular company and what are your targets and goals after joining the company. You need to understand the difference between the resume and the cover letter very carefully because you can make a mistake while preparing them which can lead to the loss of an excellent job for you. Why are the Cover Letters So Important? Attaching a cover letter with your resume is crucial. If your resume is convincing enough which can motivate the reader to go through your Cover Letters, then, it can be essential for your job. Your cover letter must mention the reason for your willingness to join a company so that the reader will be able to see why you are different from others for this job. Every company wants to hire a person who will help in the growth of the business, and you should mention this point in your cover letter as your target and goal. 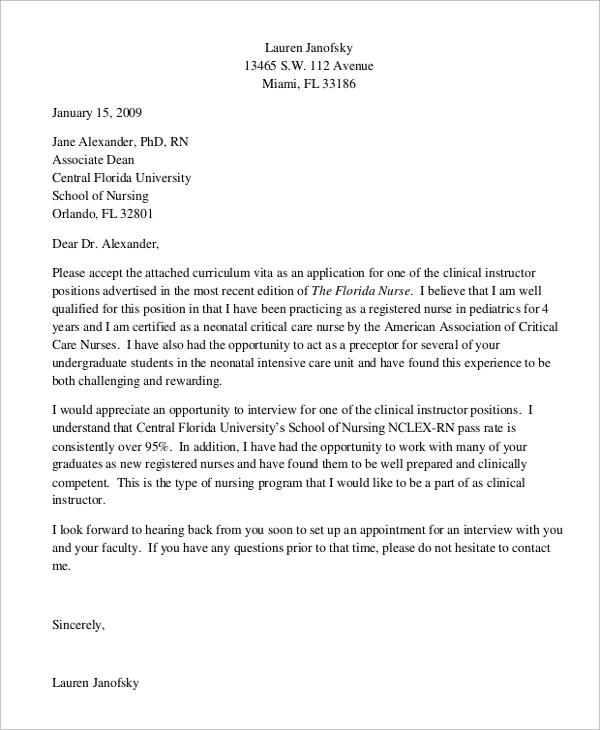 All the relevant information about the nursing cover letters mentioned here can help you to prepare one. Try to implement these things to make your cover letter attractive and appealing.